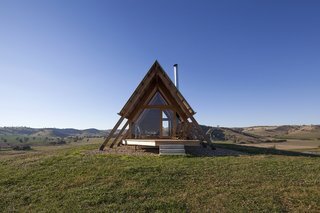 Located two hours west of Canberra in the serene Australian countryside, an A-frame rental offers a unique glamping experience. One of the main highlights at JR’s Hut, an off-the-grid glamping destination in Southeast Australia, is without a doubt the views. 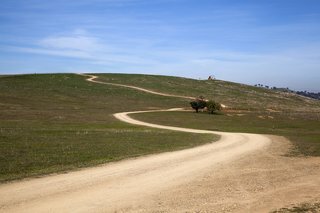 The panoramic vistas not only capture the magnificent Murrumbidgee River flats and Kimo valley, but also the rolling green hills and beyond. But that's not all there is to love about this hilltop getaway. Designed by Anthony Hunt Design and Luke Stanley Architects, JR’s Hut is the newest addition to Kimo Estate, a remarkable 7,000-acre property with a rich history dating back to the 1830s. Now a second-generation working sheep and cattle farm, Kimo also welcomes guests seeking an elegant wedding ceremony venue or luxurious rural retreat. A sheltered patio provides the perfect place to sip wine and take in the views. 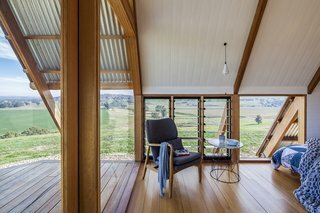 To bring visitors and newlyweds closer to the landscape, Kimo Estate owners David and Emelia Ferguson first approached Anthony Hunt and Luke Stanley for on-farm accommodation that was both contemporary and eco-friendly. 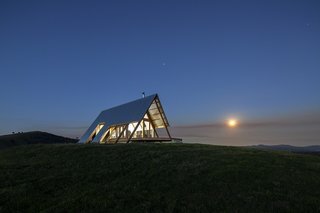 Given the remote hilltop location, the architects opted for a simple A-frame structure with locally sourced materials. 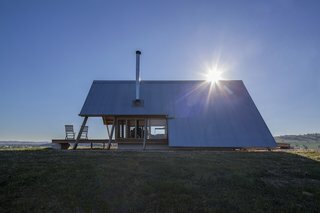 "It was to provide comfortable accommodation for two people, with an emphasis on disconnecting from the digital world and reconnecting with the surrounding landscape," says the architects of the 301-square-foot eco retreat. 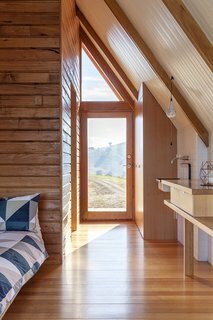 Sustainably sourced Australian hardwoods are used throughout the tiny dwelling, while handcrafted details evoke the character of the surrounding agricultural buildings. JR’s Hut—named after James Robinson, a former owner of Kimo Estate who dramatically improved the land in the late 19th century—features an exposed A-frame hardwood structure. This design not only channels a back-to-nature character, but it also serves a practical purpose given the remote location and limited labor. David Ferguson of Kimo Estate took construction into his own hands through a two-person, owner-builder team. 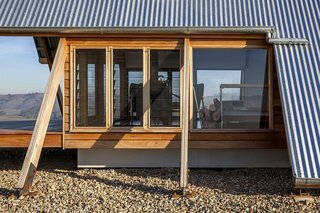 In keeping with the brief for an eco retreat, JR’s Hut operates entirely off-grid with power provided by solar energy and rainwater harvested for reuse. 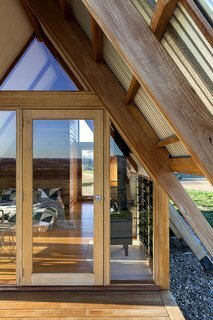 Sustainable and locally sourced Silvertop Ash and Blackbutt boards have also been used internally and externally. 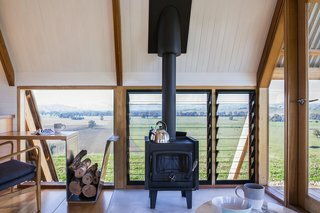 A freestanding Nectre wood-burning stove provides extra warmth in winter, while operable louvers let in cooling breezes in summer. 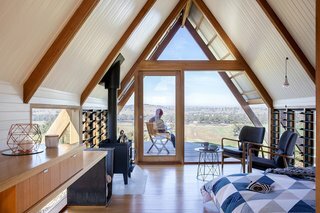 Set on a prominent hill away from prying eyes, the charming A-frame is wrapped in ample glazing to fill the interior with natural light. The abundant daylight and framed views make the modern and minimally furnished interior feel much larger than its size lets on. 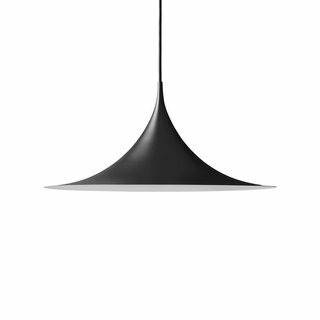 The Gubi lighting Semi Pendant is both a funnel and a vortex, channeling strong down light from its flared shade. Designed in 1968 by Bonderup and Thorup, the Semi is a functional light based on geometric principles; the silhouette emerged by placing two quarter circles inversely together. Stargazing is easy thanks to the lack of light pollution. The glazed door, along with other openings, allow guests to enjoy sunset views from bed. The A-frame structure is elevated on pad footings. 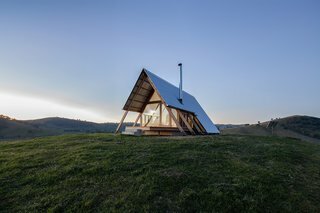 A lightweight, corrugated zinc roof clads the exterior. The Silvertop Ash sloped walls contrasts with the v-groove pine that wraps around the bathroom. 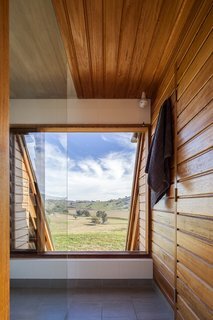 Even the bathroom comes with an expansive view.